I’ve discovered there is a word for people like us who like to explore places on foot: flâneurs or ‘strollers’. 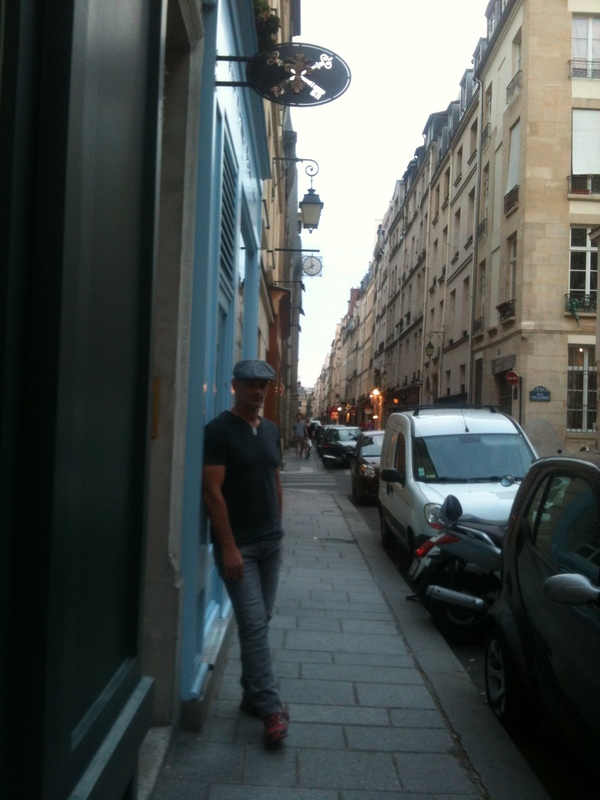 Although we did master the Metro today, nothing compares to wandering the streets of Paris. Negotiating cobblestones and catching the delicious smells that waft from the boulangerie (and the not-so-delicious from god knows where). Drinking in the shapes and colours of buildings that will outlive us all. Hearing l’enfants laughing and playing somewhere behind a school’s high stone wall or the piercing ee-aw of police sirens on some urgent mission. Or stopping to people-watch and savour double expresso avec du lait sur le côté. 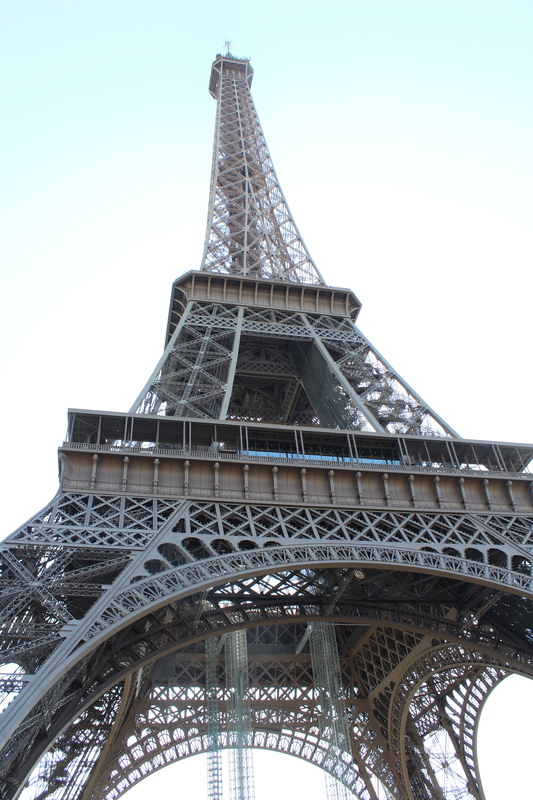 But let’s back track to Sunday… possibly the worst day we could pick to see the Eiffel Tower – an engineering masterpiece but, mon dieu, the lines. There was no way EB was going up there if he had to wait in a line of more than a hundred people. So we took the stair option to the second floor… then stood in line for an hour to get the lift to the top. Gustave Eiffel’s winning design for the entrance arch to the 1889 World’s Fair, the Eiffel Tower was originally built to be torn down. Even so, the protests began as soon as work commenced on the latticed iron tower in January 1887. Nicknamed la dame de fer (Iron Lady), very few Parisians appreciated their city skyline dominated by this apparent monstrosity. Today, it’s said to be one of the most recognised monuments in the world – and one of the most visited. Surrounded by hot, bothered tourists anxious to get to the top, I’m easily convinced. Needless to say, we flâneured (is that a word?) out of there pretty quickly and recovered over a glass or two of Ruinart, my favourite French champagne. Ah Paris, voilà ce qu’est la vie. If you’re not completely insane and you like to wear something other than sensible walking shoes, taking a Batobus (boat-bus) is a good option and gives you a different perspective of Paris. It’s hop-on, hop-off at eight different stops along the Siene. A five-day pass cost us €21 each. A day ticket is €18. After a long day on your feet, relax with a brilliant Thai massage at Nuad Thai Sabai on the Quai de la Tournelle (Metro: Pont-Marie, Sully Morland or Jussieu). This entry was posted on Monday, September 10th, 2012 at 4:53 pm	and tagged with Paris and posted in France, Uncategorized. You can follow any responses to this entry through the RSS 2.0 feed.